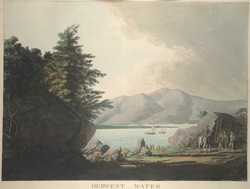 View of Derwent Water in Cumbria, part of an area known as the Lake District. The surrounding fells with their mixture of trees and crags provide a beautiful backdrop to the bays and promontories that form the banks of the lake. Thomas Gray, one of the first tourists to the area in 1769, commented thus about the scenery, “The place reminds me of those passes in the Alps, where the guides tell you to move with speed, and say nothing, less the agitation of the air should loosen the snows above, and bring down a mass that would overwhelm a caravan”.